The Tax Reform that Will America Great Will Hurt Many Americans. Are You One of Them? The Tax Reform that Will Make America Great Again Will Hurt Many Americans. Are You One of Them? “Reduce taxes across-the-board, especially for working and middle-income Americans”: that was Trump’s campaign pledge. And now the Donald is about to move into the White House and is backed by Republican majorities in both House and Senate. Which means he has a real shot at fulfilling that pledge to the letter. So, what are the specifics of his plan, and how would it affect you? First and foremost, Trump’s income tax reform is a simplification: he wants to cut down the number of tax bands from seven to three. But simplifying is not necessarily the same as reducing taxes. As this graph demonstrates, some taxpayers would definitely benefit from Trump’s tax reform – especially those at the higher end of the income scale. There are others, however, who would see their tax rates go up. Especially those on lower incomes. The current income tax bands range from 10% and 15% at the lower end of the scale over 25%, 28%, 33% and 35% in the middle to the top band of 40%. Under the Trump plan, only three tax bands would remain: 12%, 25% and 33%. This would be good news for everyone currently in the top two brackets (35% and 40%). These taxpayers would see their effective rate drop down to 33%, by 2 and 7 percentage points respectively. Conversely, the simplification would bad news for the taxpayers in the lowest bracket (10%). These would see their effective tax rate go up by 2 percentage points, to 12%. But even in the middle, where many would stay in the same bands as before (25% and 33%), there would be losers as well as winners. Most people in the 15% bracket would drop down to a 12% rate. But a tiny sliver of top earners in this bracket (earning between $37,500 and $37,650) would have the misfortune of seeing their effective tax rate go up by 10 percentage points, to 25%. A similar thing would happen to the old 28% bracket: taxpayers with incomes between $91,150 and $112,500 would drop three percentage points to 25%, while those between $112,500 and $190,150 would see their tax rate go up 5 percentage points to 33%. 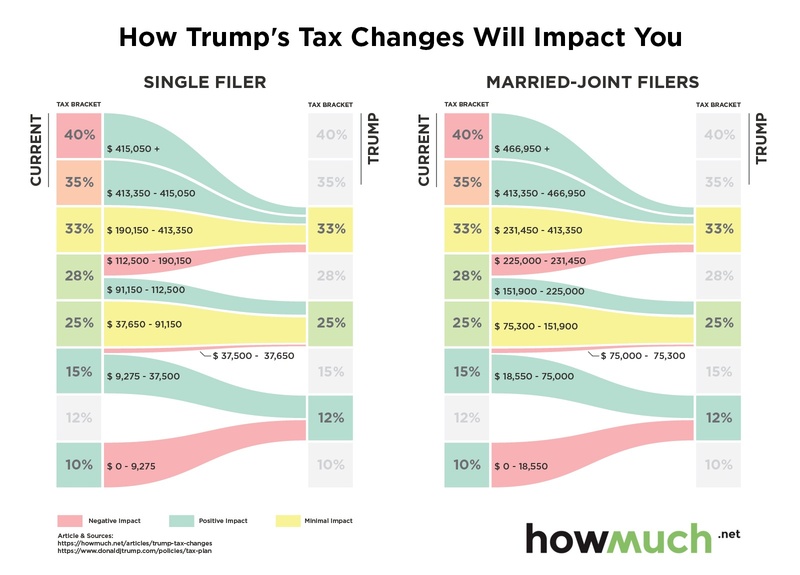 All income amounts quoted here apply to single filers (left side of the graph); but the graph also shows the changes for joint filers (on the right). The calculation is pretty easy – double the amounts for the single filers. The graph does not take into account other aspects of the Trump tax plan not directly related to the changes to income tax bands, such as the increase of standard deductions and a cap on itemized deductions, although of course these would also have an impact on net incomes.